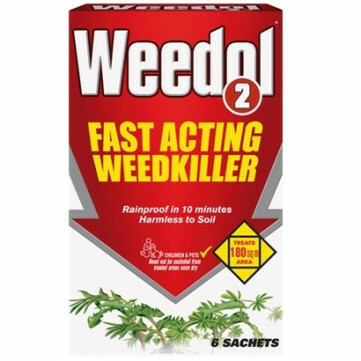 Weedol 2 is a fast-acting weed killer for use all around the garden (except on lawns). It is harmless to soil and sowing and planting can be done as soon as the liquid has dried. It is rainproof in ten minutes so weed control is not reduced even with light rainfall after this time. 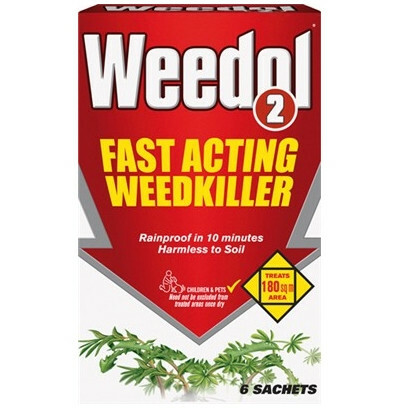 Suitable for use all year round, in bright, sunny weather, see visible results in a day or two but results can take a little longer in winter when plant activity is reduced. The measured dose sachets facilitate mixing for correct concentration. Each sachet can treat an area up to 30 square metres. Harmful. Danger of serious damage to health by prolonged exposure if swallowed. Irritating to eyes and skin. Dangerous for the environment. Toxic to aquatic organisms, may cause long term adverse effects in the aquatic environment.